Lights. Lasers. and LED’s. Now more than even we see DJs creating a visual spectacle that includes psychodelic visuals, high tech 3D mapping, and pyrotecnics. 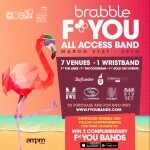 As the arenas grow bigger and the crowds become more demanding DJs push the envelope to bring a multi-sensory experience to fans and ravers alike. 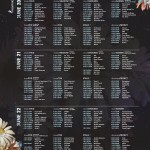 While we go to music festivals for the artists and the music its always the stage that turns a show into a performance. 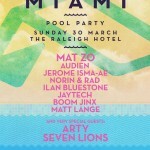 Here are our top 10 stages in the electronic music industry today. Have you experienced any of these? We’d love to hear about it. At the forefront of stage production is producer, Amon Tobin. Amon Tobin is not really about the music or having a crazy time at a rave, he’s more about the experience his audience takes through his mind-altering visuals and stage production. 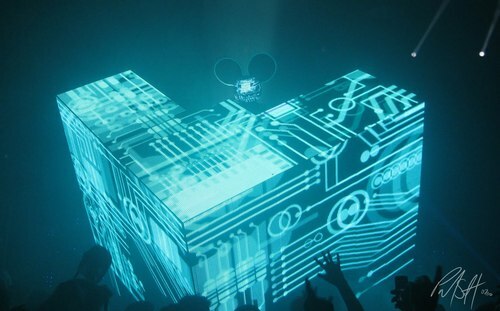 With some of the best 3D mapping software on the planet, his shows are definitely something to experience at least once in a lifetime. 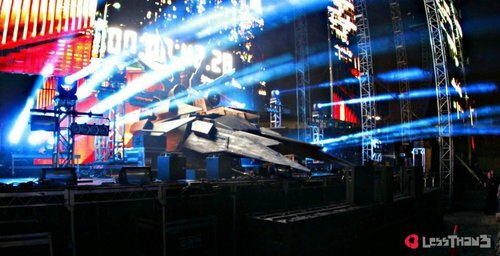 Excision has always been known for two things; heavy bass and mind blowing stage set ups. 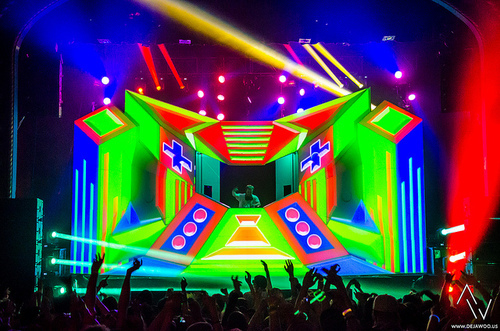 When Excision released the executioner stage for his 2012 tour, it blew just about everyone’s minds that had the chance to experience this laser heavy monolith. 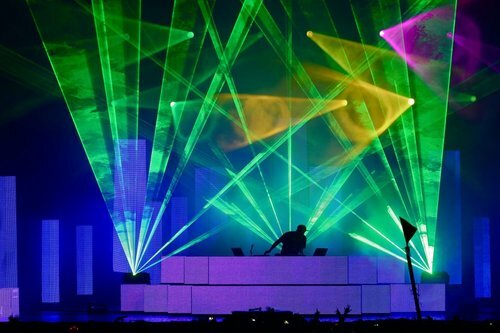 Pretty Lights has always been ahead of the game when it comes to stage production and light set ups. As his name blatantly shows that his lights sure are pretty. 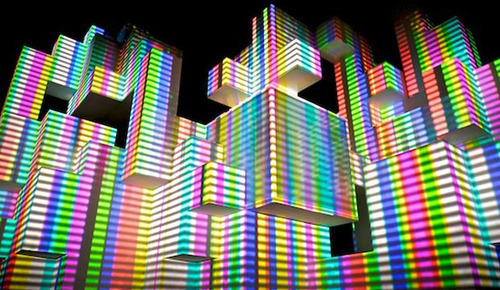 When Pretty Lights decided to up his game and add these beautiful towers with a giant LED backdrop, people were stunned at how far producers could go when it came to stage sets ups. 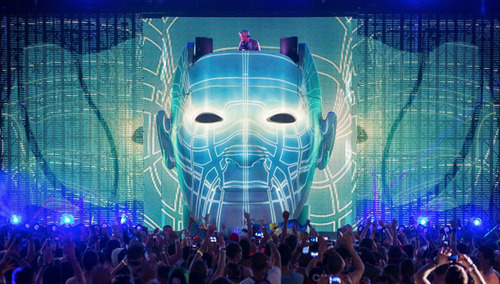 With a lack of epic visual productions in mainstream house/trance, Avicii brings to the table, the giant head production set up. 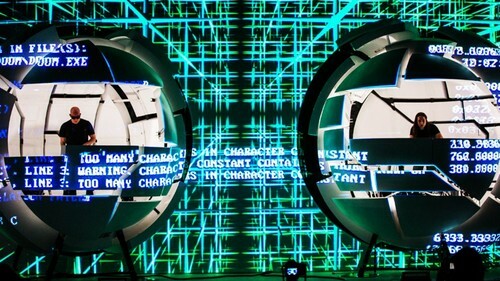 This Giant 3D mapped head displays some of the most beautiful visuals and is also equipped with enough lasers to blind an entire city. Infected Mushroom is primarily known for their trippy psy-trance, as they used to play as a full band, now DJ set they’ve created one of the craziest light set ups in the history of EDM. These two giant 3D mapped orbs brings its audience through a crazy journey across mushroom lands and through space and time, and are equipped with some of the most high tech DJ tech in the industry. 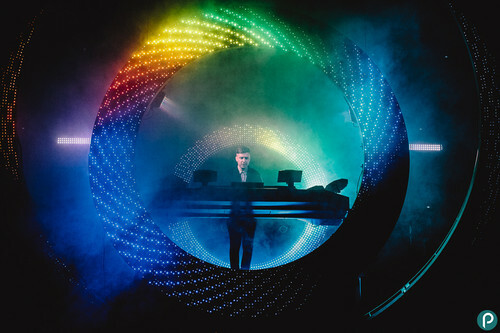 Subfocus, one of the best drum and bass/dubstep DJ’s, he recently introduced his visually astonishing new stage set up, full equipped with some of the most mind bending visuals with Subfocus placed dead center in the action. While Eoto may not be a common household name; Eoto is a multi-instrumental electronic jam group with one hell of a stage set up. This Lotus flower is 3D mapped to some of the most psychedelic visuals anyone could ever have the pleasure of watching. 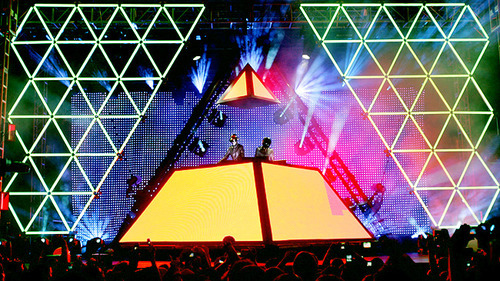 Skrillex has always been one to wow his fans with some of the craziest production set ups in the history of EDM. When the Mothership was first announced this behemoth of a stage was sure to blow everyone’s mind. Even though not many have been able to see this beautiful structure, it is surely one of the best and even oldest in the game. Daft Punk definitely brings to the table one of the best productions in history and we have still yet to see what they will bring in the future.